Do you have Broadband Internet Access? Yes, we have a high speed internet connection with WI-Fi available in most cabins. We do not charge our guests extra for this costly service. Wi-Fi access may be limited to certain cabins and is not guaranteed. Why should we pick Cabins On Strawberry Hill? First and foremost, we are the closest cabin resort to the Valley of the Sun. We are a 90 minute drive (Scottsdale, Fountain Hills, Mesa, Tempe) to two hour drive (central Phoenix) from most areas of the valley. As a result, you will spend less time driving and more time enjoying our resort. Most Flagstaff rental cabins require a trip through busy city streets, resulting in an extra hour or more of driving (each way). We also feel the elevation and location here are perfect for what most people desire. At 6100′ elevation, we are consistently 20-30 degrees cooler than Phoenix and Tuscon, comparable to a Flagstaff cabin rental or Christopher Creek cabin resort. Nice and cool in the summer, beautiful fall colors, lots of snow in the winter and absolutely gorgeous springtime! If you are looking for a cool, affordable, relaxing, clean, fun and enjoyable place to spend your time, we have created the spot for you. We hold our resort to higher standards than most cabin rentals. As a result, you will find our cabins to be exceptionally CLEAN and tidy. They are also very well equipped. We provide all the necessary items to make your getaway enjoyable. For example, our rental cabins are equipped with cooking ware (pots & pans, utensil, etc. ), linens, refrigerator/freezer, microwave, toaster, coffee pot, cable TV and much more. In addition to the kitchen items mentioned above, a 22 quart electric roaster oven is available upon request for holiday meals. Please keep in mind there are only a few and are provided on a first come first serve basis.” We also provide free wood for guests to burn in their wood stoves from mid-October through April. Guests are welcome to bring their own wood also. The resort does provide the wood for the campfire pit in our gathering area as well. We feel this is a substantial benefit to our guests as many of our competitors do not offer this very costly amenity. The resort also offers countless activities on the grounds for our guest to enjoy. We are located approximately 17 miles north of Payson, 64 miles south of Flagstaff and 69 miles southwest of Winslow. Our driveway’s GPS Coordinates are N34°24’39.4″ W111°29’28.4″ For specific directions please see our DIRECTIONS webpage. Why is 6,100 feet elevation perfect? Our elevation is perfect for a mild winter and a cool summer. The temperature in Strawberry is usually about 20° to 30° cooler than Phoenix. This elevation is also considered perfect because most people do not develop uncomfortable symptoms due to oxygen deprivation. Elevations above 7,000 feet commonly cause people to develop oxygen deficiency headaches. Furthermore, we normally do not have the strong winds that frequently occur in places such as Greer, Heber/Overgard, Forest Lakes, Showlow, Pinetop and Flagstaff. Above the rim the winter winds often last for days and even weeks. Here at the resort, we have received snow showers starting as early as October and as late into the winter season as April. Only Mother Nature currently knows the answer to that question. Go to www.weather.com and type in the zip code for Pine, AZ (85544) for a professional’s guess/estimate. That forecast is for the Village of Pine. We are about 600 feet higher in elevation than Pine, so we will be cooler by several degrees. From late October through April, we frequently have snow here in Strawberry. If not, you’re likely to find some snow within a 10-minute drive of the resort. Here at the resort, there is a wide variety of recreational activities. We have a large children’s playground consisting of a swing set, slide, playhouse, rock wall, monkey bars, and a sandbox. For older children or adults, we have a basketball hoop, volleyball/badminton court, horseshoes, tetherballs, and a ping-pong table. 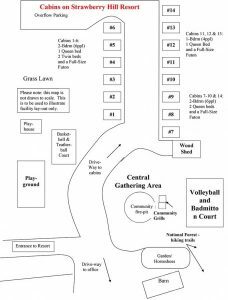 We also have a large, flagstone gathering area with a campfire pit (wood included), as well as propane grills and picnic tables. The area also offers numerous hiking and mountain biking trails, including one starting at the edge of our property and heading into Tonto National Forest. Are there any restaurants or grocery stores close by? There are three restaurants within a 5-10 minute walk from our resort. Several additional restaurants are in Pine, which is a short 3-mile drive away. Please check our DINING webpage for descriptions of the various restaurants. We have tried them all so we can offer recommendations based on our personal experiences. For basic groceries, the Strawberry Market is only a quarter-mile away. For fuel or general merchandise, Uncle Tom’s Texaco convenience store is located in Pine (3 miles south.) If you need enough to justify the 20 minute drive, groceries are cheapest in Payson. What does “housekeeping cabins” mean? This simply means there is no daily housekeeping done by resort staff. We do not enter your cabin and make the beds on a daily basis. We do clean cabins and change bedding on a weekly basis if your stay is greater than one week (upon request). What type of vegetation is around Strawberry? There are wild strawberries (they now are very rare), blue berries, black berries, raspberries (abundant in fall) and more. Here in northeast Strawberry we are within the Ponderosa Pine forest. Around the cabins there are large deciduous trees that provide excellent shade in the summer months and permit the sun to warm the cabins in the winter months. Around and near our property you can see huge Ponderosa Pine, Red Oak, Gamble Oak, Scrub Oak, Juniper, Cedar, Pinon Pine, Manzanita and more native trees. We also have apple trees, a cherry tree, two pear trees, a peach tree and two plum trees that produce delicious fruit in the fall. What comes with the cabin? When our family stayed at resort cabins for weekend getaways, we felt they often did not supply what we expected. As a result, after buying this resort, we have added the features we would expect. For example, each cabin offers a padded bench on the front deck as well as a picnic table on the back patio. In addition, there is a free standing wood stove fireplace, large cushioned chair, queen sofa sleeper and cable TV in the living room. The kitchen area is equipped with 4 to 6 bar stools and buffet bar, a double sink, 4-burner stovetop, microwave, coffee maker (w/filters, coffee, sugar and powdered creamer), toaster, 10 or 12 cubic foot refrigerator/freezer, paper towels, dish soap, wash cloth, dish towel, salt, pepper, pots/pans (please bring larger ones for groups of more than 6 people), plates, glasses, coffee mugs, silverware, spatula, barbecue grill brush and more. Additionally, a 22 quart electric roaster oven is available upon request for large or holiday meals. Please keep in mind there are only a few and are provided on a first come first serve basis.” The downstairs bedroom has a fan & electric heater, spare blanket, 2 spare pillows, bed w/headboard, top of the line Serta “Five Star” or “Luxury Suite” queen mattress and box springs. The bathroom has Kleenex, tissue paper, several 1 ounce (larger size) bar soaps, disposable plastic cups, bath towels, hand towels, wash cloths, bath mat, commode, combo shower/bath tub, mirror, outlet for shaver/dryer (please bring your own). We also have 3 gas grills positioned in pairs around the resort for shared use among our guests. Shampoo & other personal toiletries. In the summer, bring bathing suits and beach towels for swimming in the creeks. In the winter, bring spare shoes and clothes because they tend to get wet when playing in the snow. We have one spare blanket in the cabin, so if anyone in your group is cold natured, you may wish to bring additional spare blankets. Please do not take the blankets outside on the grass. Our cabins are equipped with everything you need to make simple meals. The cabins do not have a conventional oven, however each cabin has a microwave oven and a 4-burner stove top. Often in the summer it does get chilly at night. We recommend that you bring a sweater or light water resistant jacket, short & long pants, a flashlight (great for a moonlight walk), sunscreen, water-shoes, good hiking shoes and your camera. Yes, we have a private well. Our cabins are equipped with 30 gallon, 220v dual element fast heating hot water heaters. Yes, we are a pet-friendly resort. Please read our pet policies before making your reservation. We have a pet/dog contract on our POLICIES page that you must adhere to. The policy is very strictly enforced, so please read it thoroughly. We do require a fee for dogs ($10 per night per dog). Because of the problems we are having with dog owners (not the dogs themselves), we are unfortunately considering banning dogs. Please abide by the rules in the contract so that we may continue to welcome dogs to our resort. NOTE: Once you have made your reservation, email us at info@azcabins.com and let us know that you are bringing your dog(s) so we can note that in your reservation file. On a daily basis squirrels, blue jays, woodpeckers, humming birds (summer), and other small wild animals are seen. Elk and deer pass through or around the resort property several times a week. About every other week Javelina are seen. Most winters a hawk and bald eagle nest nearby. About once every 3 to 5 years a bear is seen. The best rule of thumb for any wild animal is to leave it alone and observe it from afar. They are beautiful creatures that need to have their stress minimized by limiting human impact. Please see our wildlife page. How many cabins do you have and how close together are they? We have 14 cabins on over three acres here at our resort. Our resort cabins are centrally located on our property and are spaced about 30 feet apart side-to-side. Unlike many “cabin rentals”, you will not arrive and find out you are in a duplex, triplex, or condo. Our rental cabins are all individual cabins with no shared walls. Are you on a creek or lake? No, we are not on a creek or lake, as all water is encompassed within the national forest. Strawberry Creek (an intermittent creek) is about 500 feet away. During the snow melt and monsoon you can hear and see it run. The quickest fishing to drive to is the East Verde River, which is about a 10 minute drive. Fossil Creek is 10 miles west of us and Blue Ridge Reservoir is above the rim. For specific fishing and swimming details, please see our fishing or swimming page. Yes, each cabin has a woodstove fireplace with glass doors so you can see the fire. We provide wood from October through April. The woodstoves are the cabins’ main source of heat. Additionally, the cabins also come with small electric heaters. Do you have a Jacuzzi or pool? Not at our resort. Nature provides an incredible hot tub at Verde Hot Springs (95°F water) west of Strawberry. This will be a much more memorable and enjoyable experience than a Jacuzzi. Fossil Springs provides a breath taking, beautiful place to swim with naturally heated water at 72°F. Please see our HIKING page for more information. Yes, every cabin has cable TV. Half of our cabins have a 32” TV (or larger). To be honest, most people do not spend much time here watching TV. They come here to enjoy the fireplace or campfire and nature. Yes. It has a double sink, full size 4-burner stovetop, 10-12 cubic foot refrigerator/freezer, large worktop with bar stools, microwave, coffee maker and coffee (w/filters), cream and sugar, silverware, glasses, dishes, pots, pans, and utensils for simple meals. We sanitize all the kitchen items after each stay. If you are cooking for a large group and need oversized pans, we do request that you bring them with you. We supply dish soap, paper towels, dish towels, wash cloth, coffee filters and salt & pepper. Please bring condiments you will need along with any special utensils. Remember- each cabin has its own charcoal grill on its back patio (please bring charcoal) and we have three propane grills located around the property for shared use among our guests. Can we check in early or out late? We do not allow early check ins due to high frequency of turnovers and limited staff, so PLEASE do not arrive before the 3PM checkin time. Late Checkout is allowed when available and must be arranged in advance. Can we stay one night? Yes, but usually only on weekdays. Many weekends require a 2-night minimum stay. If you can only stay for one weekend night and wish to inquire about availability, you can either check the availability yourself by clicking on the link at the top of this webpage or by emailing us at info@azcabins.com. We will accommodate you if we can. Do you provide ice or drinking water? The tap water here comes from our well, which is nearly 800′ deep. It is very drinkable and has a good taste. Our water is high in calcium (good for your bones) but does not have that liquid concrete taste that most city water has. In addition, each cabin has ice cube trays. Do the cabins have phones? Our resort cabins do not have landline phones. Your cell phone may work from our resort depending on your provider(some guests say “unfortunately”). Verizon is the BEST for reliability. We do take emergency messages for our guests. We normally do not answer our phone after office hours so that we may have uninterrupted family time. Are you close to the Grand Canyon? We are less than 150 miles to the Grand Canyon. Because wildlife along the way limits the speed, it is about a two-and-a-half to three-hour drive. We recommend that you sleep at one of the hotels in Tusayan or at the South Rim so that you can relax there and see the spectacular sunrise and sunsets the canyon displays. I have taken relatives and we have had numerous guests who choose to stay here and make the trip to the canyon & back in one day. That is up to you.